The beginning of the universe in time is the single biggest bug-bear for the secular cosmologists. They must eliminate the need for the beginning in order that they can eliminate the need for the Creator Himself. If you have an origin in time, you can argue that anything that exists, and had a beginning in time, also had to have a Creator. 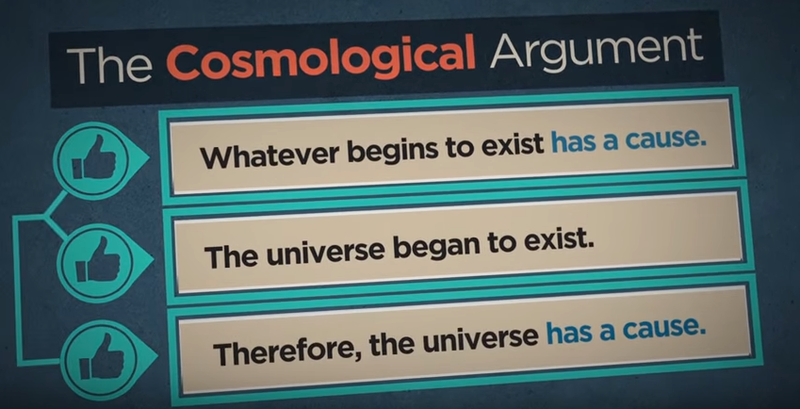 This is the Cosmological Argument. And if the big bang cosmologist agrees the universe exists and began to exist at some moment in time past, then it also had to have had a cause–a first cause. That first cause can only have been an infinite Creator, who is greater than the universe itself. Some long age/old earth Christian apologists use this argument starting with the assumption that the big bang was a real historical event. That also is a flawed approach even though they use valid logic after the fact. Their initial assumption–their starting premise–is not a fact (or cannot be proven to be a fact) and hence the rest of their argument fails. But what would these apologists, like W.L. 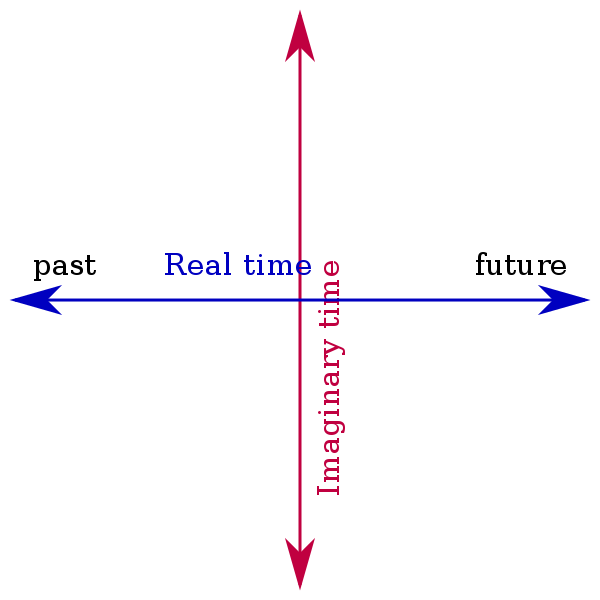 Craig or H. Ross, say when the secular big bang theorists continue to push towards the elimination of the origin in time, even the big bang beginning itself? He states his belief as if fact, i.e. that the big bang definitely happened, even though cosmology is not actually science. See Cosmology is Not Science! His theory has no super-dense initial singularity. But he assumes, as fact, an early period of cosmic inflation (which is a best speculative), which eventually finished and gave rise to the hot big bang fireball that the rest of this universe allegedly evolved from. He leaves open the question whether the universe was eternally inflating in the past, but the one thing he is certain of is that the big bang was not the beginning of the universe. 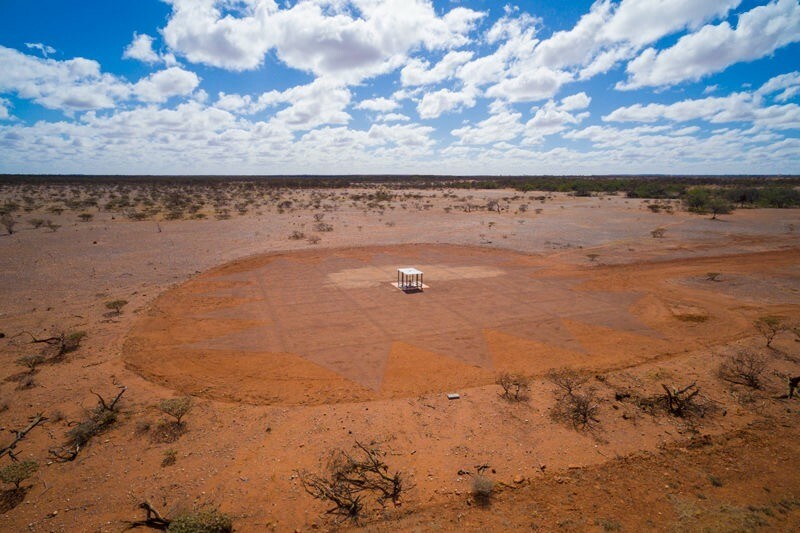 Others have proposed an eternal universe that eventually explodes in a big bang. Eliminate the need for the big bang to be the beginning in time and eventually they hope they can eliminate any need for the Creator Himself. After all didn’t the universe create itself? Quite obviously not. For, in the beginning God created the universe (Genesis 1:1). 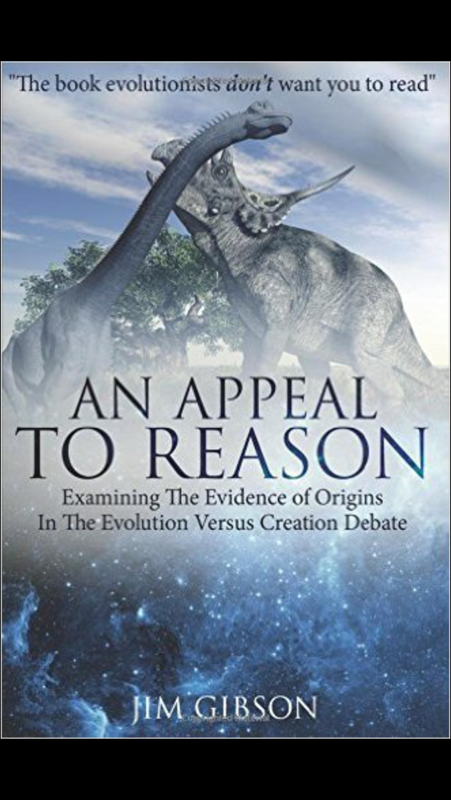 “An Appeal to Reason” is subtitled “Examining the evidence of origins in the evolution verses creation debate”. The author, Jim Gibson, employs a witty and, in some cases, sarcastic style. He intends the book to appeal to the younger generation, who have little knowledge of the facts surrounding the story that is now taught universally in the education system of the origin of life on this planet. Evolution is marketed as a fact—as the true history of life on Earth. The author points to many scientific discoveries that contradict that story. Published by Tate Publishing, Oklahoma, USA (2014) and available from Amazon.com. The book is wide-ranging in its subject matter, yet does not load the reader with too many or superfluous details, yet provides sufficient explanation to show that the biblical creation model of understanding the history of the universe and life on Earth is a far better explanation than that offered by the evolution story. Jim Gibson’s approach to the subject is different to the approach I have read in many other creationist publications that deal with similar material. It is fresh, insightful and challenging to anyone willing to open their mind and use commonsense and reason in understanding the evidence—both present day observations and accounts from history as recorded by scientific observers over the past few hundred years. Therefore I recommend it to everyone. Part 9 of my review of the book: “The Big Picture: On the Origins of Life, Meaning and the Universe Itself,” by Sean M. Carroll. Part 8 is found here. The next chapter entitled “Emergent Purpose” is about finding some sort of ‘purpose’ as an emergent property of evolution. He is quite clear that evolution itself is undirected but suggests that we humans can find some purpose in it. He starts out with a question “Why do giraffes have such long necks?” and gives 4 possible answers, 3 of which evolutionist would believe. Option 1 he declares incorrect, which is Lamarckian, yet actually closer to Darwin’s original idea. Options 2 is the common way of explaining neo-Darwinian evolution, with mutations conferring better fitness. Option 3 is about sexual selection and option 4 is in line with his overall message of the book. None of this sentence has any credibility. Only by assuming everything to be true in the evolution story from the big bang to current day could you write this. So it is not a science statement but a theological statement. He says it avoids any particular evolutionary story, but it is not hard to imagine that the words “came into existence” does not mean at the hands of the Creator, but rather is a big bang. Otherwise there would be no need to start in the big bang, nor include the words “our location in the cosmos”. He says this is a poetic-naturalism way of speaking about emergent properties of the biological world. But that could only be true if you could demonstrate experimentally that each requirement in the statement is true. 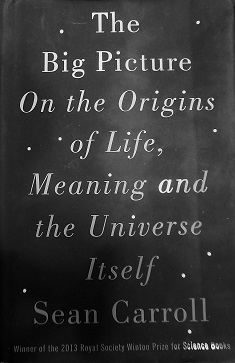 Part 6 of my review of the book: “The Big Picture: On the Origins of Life, Meaning and the Universe Itself,” by Sean M. Carroll. Part 5 is found here. Carroll spends several chapters discussing the quantum mechanical framework for the Core Theory, as he calls it. Quantum mechanics has been an extremely successful physical theory exquisitely predicting with enormous precision some parameters in particle physics. But what many people have heard of quantum theory is more about the various interpretations applied by physicists (e.g. Bohr’s abstract physical description, or, Everett’s many-worlds) to the way the theory might work beneath what we can measure. Regardless of the correct interpretation it has enjoyed enormous success as a theory of physics in what is called the standard model of particle physics. The second very successful theory is general relativity—Einstein’s theory of gravity. Both work extremely well in their respective domains of operation, but outside that, in the realm of what is called quantum gravity neither operate nor has a theory been found to unite them. 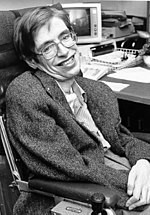 But that is exactly what Stephen Hawking and others have been seeking, to have the Universe begin in a quantum fluctuation of a meta-stable false vacuum.